Each table consists of a mirror veneer walnut top with walnut cross banding and caddy moulding to the edge leading down to an oak lined walnut drawer, having fine cross banding with a solid walnut block front to the centre and finely figured walnut veneer to either side retaining original brass drop handles with a cushion moulding below. The sides and back consist of finely figured walnut veneer with walnut line inlaid decoration with a cushion moulding below. The tables are supported by four elegant cabriole legs with carved decoration to the top leading down to pad feet. 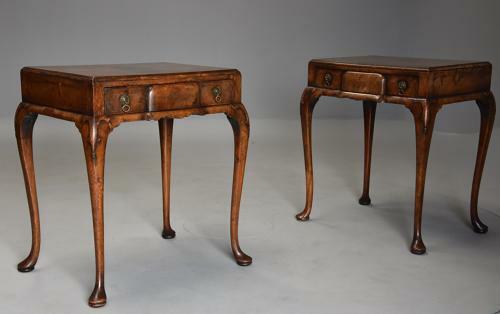 This pair of tables are in very good condition for age, they both have a superb patina (colour), this patina having the appearance of period Queen Anne furniture, they are of stable construction and can go straight into a home - they are very versatile and could be used in various rooms and settings, maybe as hall tables or bedside tables etc.